Not only home variations or demos but fully created sites for you ready to publish on the net. More than 20+ ready to use sites created with research and dedication. Choose the right one and go online in 5 minutes. Specular is the last theme you will ever need to buy. Keep coming back to this page to get the latest updates. New Features and Demo Sites added every week. Codeless Team have worked hard to ensure you the infinitely possibilities that this Bundle Theme can offer to you : Buy 20+ Themes at price of one (more in advance). If you do not find the right Demo site for your need, vote now to our survey what you need more from Specular and our specialized team will provide these features or demos to the next update. The last but not the least: With Specular you can create your custom site very very easy and in the most fastest way you have ever tried. Endless Options and Possibilities. These are our three major logic separations on Specular. What this mean? This means Codeless. No more code skills needing to start up your business, to boost your online sales, to create your portfolio, church, medicine, creative, photography, travel, restaurant (and much more) presentation sites. With more than ten years experience in web site building and marketing campaigns we are able and sure to provide our customers with the possibility to create the best seller product on the market. For example: If you need a page for marketing or sales product you can easily create a custom header layout, remove the footer, remove the sidebars and centering the main page container in 500px or 600px. Our demo sites are created with these easy customizations. Take a look to our DEMO SITES. All our templates are created with online customizer in mind. You can create your personalized template with possibility to change a lot of options to fit your needs before you spend money on it. With online customizer you can create more than 200+ layouts and unique styles like no other theme ever created. After created your personal template export it with a single click and goes online in 5 minutes. Be member. Get exciting extras. 24/7 dedicated support with more than 12 staff members. Get free new demos created from the community. Suggest us what other demo you need and we will create it for you. So simple and so powerful demos install with Specular. Select one template and fully install in seconds. The new innovative import/export option from Codeless is awesome. Now you can backup your content, install a new dummy and return the backup in the most simplest way. Don’t waste time with other plugins. The last, you can share the content you have created with the community in this manner we can create the largest demo & showcase community to help our users. Specular comes with a new blog style. Fullscreen blog style is easy to configure and awesome for the client to read the new posts. Unlimited possibilities to create outstanding websites. Unique and useful demos for your next project. Get the best from a $55 theme. Custom slider from our team, with the possibility to create a slider with parallax effects animation and theme styled buttons. All new web design features and SEO practices are used for this theme to made it the most useful and successful theme ever created. Create your online shop and sell your products now. Woocommerce is fully styled and ready to use from our users. With only one click create your site with your preferred demo from our list of demos.Select one template and fully install in seconds. Create awesome slides with mixed multimedia content: video, photos with content, parallax, fullscreen. Add new widgetized area expandable with a button for your clients to fulfill their requests. Easy change colors and styles from wordpress theme customizer. Make your work easier. Specular is optimized for high resolution displays. All icons are font icons and is used the latest guidelines for css. 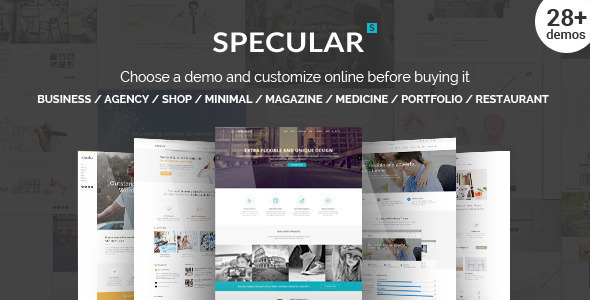 Specular has built with drag & drop page builder. Visual composer is our page builder. It’s front-end and back-end version. See our videos. With Specular you can create easly your online one page. It’s so simple and beautiful. With more than ten years experience in web site building and marketing campaigns we are able and sure to provide our customers with the possibility to create the best seller product on the market. Translate and make your website multi-language, with WPML Compatibility and .po/.mo files. $35 premium sliders are included in package. Flexslider and Codeless Slider are also included. Specular provides unlimited layout customizations. With easy to use theme options you can create an unique and perfect page for any purpose. With a staff of 12 members, Codeless will provide the most powerful and real-time support you have ever tried. No more code skills needing to start up your business, to boost your online sales, to create your portfolio, business (and much more) presentation sites. We have included custom widgets that you can easily add them with drag & drop facilities to footer, top navgation, sidebar and other widgets areas. Select for posts and pages if you want boxed or wide page layout. Also you can add background color and resize the boxed container as much as you want. You can use Specular theme as child theme too. Also you can add custom css code. You can modify entire global css or some pages only. - Comments on Demo Pages Removed. Fixed: Breadcrumbs, makes translatable the "You are here"
Added: Option to remove slider on mobile. Fixed: Codeless Slider Default Look when not id is set. Fixed: One page Links problem with simple sections. Added: Option to add upcoming date to events. Added: Enable comments on portfolio items. Fixed: Removed Animation from Text Block element. Use Column animation instead. IS THIS WP’S BEST THEME EVER?